Georgia was one of the original 13 colonies. The state was settled on February 12, 1733, by British politician, James Oglethorpe, and 100 colonists made up of poor people and those recently released from debtor's prison. The colonists settled in the present-day city of Savannah. Georiga, named after King George II, was the 4th state admitted to the Union on January 2, 1788. It is border by Florida, Alabama, Tennessee, North Carolina, and South Carolina. 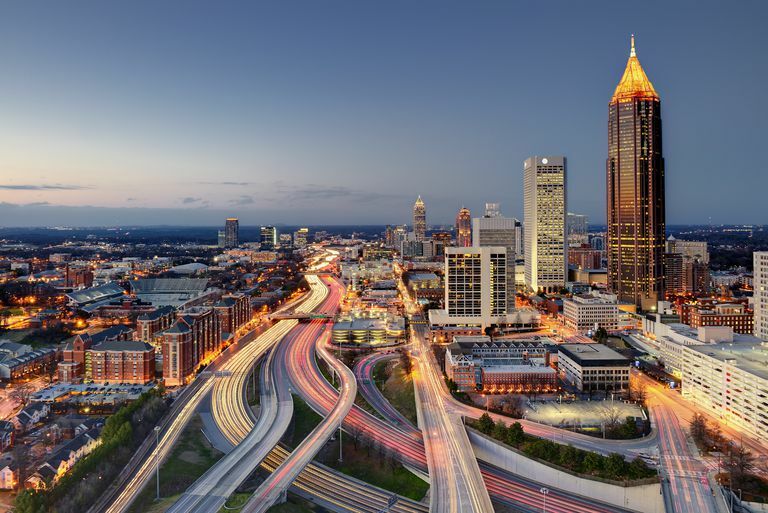 Atlanta is Georgia's capital city. It is home to Six Flags Over Georgia, the Atlanta Braves baseball team, and the Coca-Cola (invented in Atlanta in 1886) headquarters.The city also hosted the 1996 Summer Olympics. Georgia's famous people include President Jimmy Carter, and civil rights' leader Martin Luther King, Jr. are both from Georgia. Its main agricultural products are the 3 P's: peanuts, pecans, and peaches. The state is also the only place that grows the sweet Vidalia onion. Georgia's natural terrain is extremely varied, including the Appalachian Mountains in the northeast, the Okefenokee Swamp in the south, and approximately 100 miles of coastline in the southeast. Teach your students more about the Peach State with the following free printables. Begin digging into Georgia's history with your students using this vocabulary sheet. Learn more about the history of Georgia. Then, using the Internet, an atlas, or other reference book, look up each of the words or phrases in the word bank to learn their significance as it relates to the state of Georgia. Write each word or phrase on the blank line next to its correct description. Let your students review what they've learned about Georgia with a fun word search puzzle. All of the Georgia-related words and phrases in the word bank can be found hidden among the jumbled letters in the puzzle. Your students can continue to review what they've learned in a stress-free way by completing this Georgia-themed crossword puzzle. Each clue describes a word or phrase related to the state. Challenge your students to show how much they know about the state of Georgia. For each description, students will choose the correct answer from the four multiple choice options. This activity allows younger students to practice their alphabetizing skills while reviewing words associated with Georgia. They should write each term from the word bank in correct alphabetical order on the blank lines provided. In this activity, students can tap into their artistic creativity by drawing a Georgia-related picture.Then, they can work on their handwriting and composition skills by writing about their drawing on the blank lines provided. The Georgia state bird is the brown thrasher. The bird is brown with a white and brown-speckled breast and yellow eyes. It primarily eats insects along with some fruits, seeds, and nuts. The Cherokee rose, a white, fragrant flower with a yellow center, is the Georgia state flower. Georgia's official state crop is the peanut. The state is number one in peanut production in the United States, producing nearly 50% of the country's peanuts. Georgia's founder is James Oglethorpe. Oglethorpe was a British soldier and a member of Parliament. After one of his friends contracted smallpox in debtor's prison and died, Oglethorpe became involved in prison reform. His work ultimately led to the release of hundreds of people from debtor's prison. This influx of released prisoners made England's unemployment problem worse, so Oglethorpe proposed a solution - a new colony made up of released prisoners and unemployed people. The colony would provide a new start for the colonists and serve as a military buffer between the English colonies in the New World and the Spanish colony in Florida. In this activity, students will learn more about the political features and the landmarks of Georgia. Using an atlas or the Internet, students should fill in the state capital, major cities and waterways, and other state landmarks.